Regional carrier Airnorth is adding a third destination from Brisbane West Wellcamp Airport with a new nonstop service to Townsville. The three times a week Wellcamp-Townsville flights kick off on November 28 with 76-seat Embraer E170 jets and adds to Airnorth’s existing flights to Melbourne and Cairns from Australia’s newest airport. Wellcamp general manager Phil Gregory said the new flights meant travellers from the local community had a one-stop option to a number of international destinations from Townsville, as well as to Darwin, which had service to various Asian cities. “This just gives our community more options for a long weekend away in Townsville and Darwin or an international holiday,” Gregory said in a statement on Friday. Similar to Airnorth’s service to Cairns and Melbourne, Qantas would place its QF airline code on the airline’s Townsville flight, Wellcamp Airport said. Airnorth chief executive Daniel Bowden said the new Townsville flights would benefit both business and leisure travellers. “The support and interest from the Toowoomba and Darling Downs region for the current Cairns and Melbourne services has been extremely encouraging and the demand for additional quality airline services to destinations like Townsville and onward to Darwin just continues to grow,” Bowden said. The airport said the addition of Airnorth’s Townsville flights would bring to 72 the number of regular public transport (RPT) flights into and out of the airport each week, representing about 250,000 seats a year. QantasLink and Regional Express also serve Wellcamp. Will be interesting to see if this eventually turns into a WTB – DRW service that runs a few times a week. That’s a pity would of loved to of flown down for the carnival of flowers, next September for sure. How often do the flights operate? 3 times weekly apparently, with onwards connections to Darwin, so it must coincide with some of the Townsville-Darwin frequencies. Air North are gradually carving out a hub-busting network of long-thin services – good use of the E170 in Australia it would seem. If Airnorth are looking to expand their fleet , Virgin Australia is looking to off load some E170…. Derrick, VA got rid of their E170’s years ago. How do I get prices and flight schedule Townsville to Toowoomba and contact number ? Annye Kenyon – hopefully if you can post a comment on an article here, you can also use google. I”m loving what Air North and JetGo are doing with their thinner and more boutique routes. Just hope they can expand at a steady pace and not go overboard. These routes need support though, and it’s up to the locked on Qantas/Virgin “automatic” bookers to give them a try. Had a situation recently at work (very large Govt agency) where someone was going from Melbourne to Toowoomba and knowing I had connections with Toowoomba, was asking about how long to drive from Brisbane, how much time to allow etc. They were hesitant at first when I mentioned direct flights (oh what, in a LITTLE plane), but ended up finding flights that worked out well with timing, and saved themselves around 6 hours of road and waiting time for a 2 day workshop (off the plane in Brisbane, 20 mins messing around at hire car desk, finding the car then 2 hour drive in peak traffic, and navigating in a strange city, -v- 20 minute taxi ride to hotel in TWB). They were thrilled. Hopefully Air North and Wellcamp can work hard to get awareness of these flight with the general public. I think that they need to put YBSU on the map because their aircraft have about 80 seats on the E-170s and Sunshine Coast would do really well to cairns! As I think it would be kind of hard to fill the a320 to cairns! Even tho surveys show that about 300 people a day fly up to cairns from YBSU but they have to drive to YBBN! The tail paint looks a bit like Ansett? Reg would be turning in his grave. Great to see support for regional areas from Airnorth. communication and transport is essential. 14 hour plus road trips from Townsville. Love travelling in the E Jets. I like the international connections from Townsville, Cairns has many many more flights to Asia and Japan , all direct..but a good start for Toowoomba, there is a substantial population base to support flight in the future. 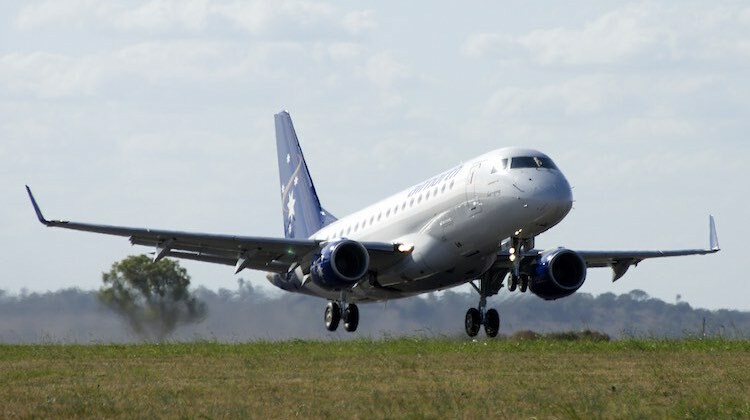 More services proving the worth of longer range hub-busting regional jets like the E170 in Australia. I really hope Air North have done their homework before getting in to bed with QF. I would hate to see Air North do all the hard work in setting up these routes only to have QF come in and gazump them for their own gain. Wouldn’t be the first time……..